…and almost a full month slipped by with lots of visiting family and not much sewing. But I am back with what caused my “writers block” . 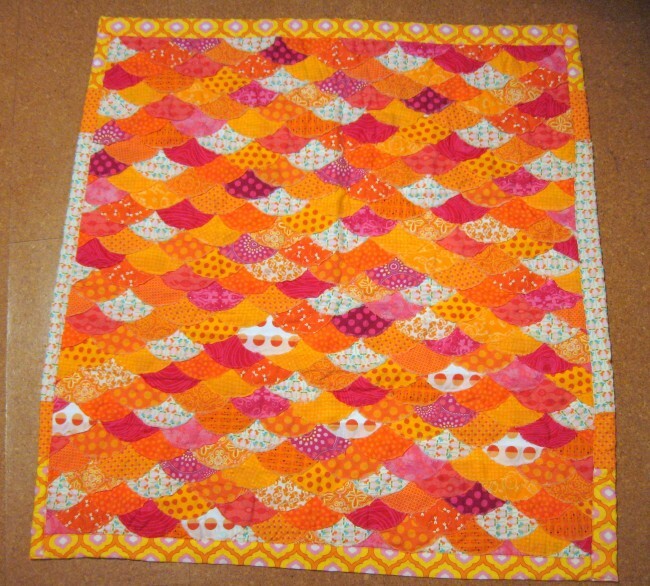 I made some fish scale pillows and loved them so much I expanded the idea to a baby quilt. All that top stitching was a total pain. The half circles puckered like crazy even with everything stabilized with heat-n-bond. I admit giving up a few times and in the end all that stitching took me weeks to finish because I was so annoyed. And then the terrible happened. I washed it blithely thinking it would fray just a bit here and there. But sadly, tons of fraying and I think it will fall apart completely if it is washed again. Wall hanging I guess. Disappointment. I pieced the back with some of my favorites. And now I am moving on . Time to start some new projects. Gotta start fresh. One month until Christmas so I will whip up some presents. sigh.